↑ 1.0 1.1 1.2 "Red Fort Complex". World Heritage List. यूनेस्को बिस्व धरोहर केंद्र. पहुँचतिथी 15 नवंबर 2009. ↑ N. L. Batra (2008). Delhi's Red Fort by the Yamuna. Niyogi Books. पहुँचतिथी 5 अगस्त 2012. ↑ 3.0 3.1 विलियम डेलरिंपल. "Introduction". दि लास्ट मुग़ल. पेंगुइन. प. 7. ISBN 978-0-14-310243-4. ↑ Gill, M. S. (2007). Trials that Changed History: From Socrates to Saddam Hussein. Sarup & Sons. प. 297. ISBN 9788176257978. ↑ "Singh becomes third PM to hoist flag at Red Fort for 9th time". बिजनेस स्टैंडर्ड. 15 अगस्त 2012. पहुँचतिथी 17 अगस्त 2012. 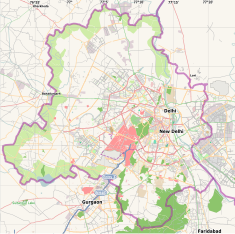 ↑ "Red Fort was designated a UNESCO World Heritage Site in 2007". Lonely Planet. ओरिजनल से 29 अप्रैल 2012 के पुरालेखित. पहुँचतिथी 4 August 2012. ↑ William M. Spellman (1 April 2004). Monarchies 1000–2000. Reaktion Books. ISBN 978-1-86189-087-0. पहुँचतिथी 5 August 2012. ↑ Mehrdad Kia; Elizabeth H. Oakes (1 November 2002). Social Science Resources in the Electronic Age. Greenwood Publishing Group. ISBN 978-1-57356-474-8. पहुँचतिथी 5 August 2012. 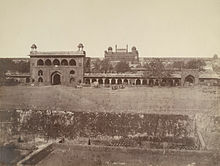 ↑ "World Heritage Site – Red Fort, Delhi". भारतीय पुरातत्व सर्वेक्षण बिभाग. पहुँचतिथी 15 अगस्त 2012. ↑ Fanshawe.H.C (1998). Delhi, Past and Present. general introduction. Asian Educational Services. पप. 1–8. ISBN 978-81-206-1318-8. पहुँचतिथी 10 June 2009. ↑ Mahtab Jahan (2004). "Dilli's gates and windows". MG The Milli Gazette Indian Muslims leading new paper. पहुँचतिथी 17 May 2009. ↑ "World heritage site". Asi.nic.in. ↑ 14.0 14.1 14.2 "A handbook for travellers in India, Burma, and Ceylon". Archive.org. पहुँचतिथी 2014-01-03.